However, once upon a time someone decided that 雞同鴨講 sounded better. 雞同鴨講 is an idiom, and is often used as slang. 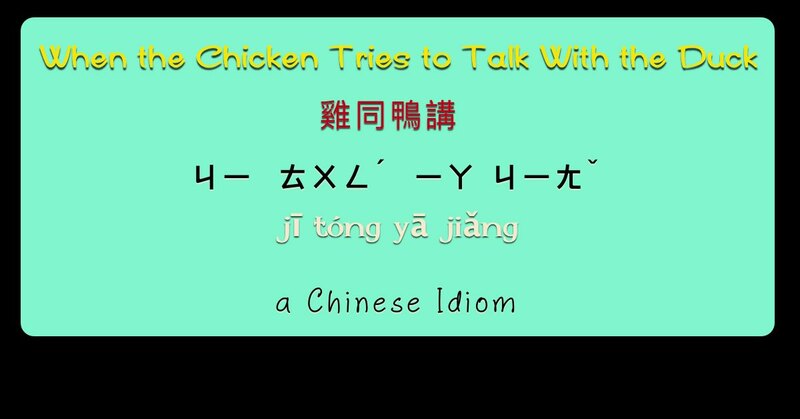 雞同鴨講 is easily understood if you remember that chickens are not able to carry on a conversation with ducks. Sometimes the vocabulary in idioms is archaic, but not this time! 同 is a common word. 講 is also a commonly used word. Hopefully, it won’t be chickens talking with ducks. ❷ Just like in English, some word order is just expected and cannot be clearly defined. ❸ This is a case of 2 third tones in a row in a word, so the one that appears first is changed to a second tone. 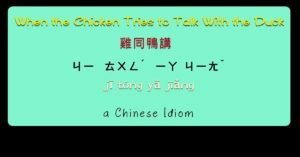 ❹ Since it is being used as a 4 words idiom, the 話 ㄏㄨㄚˋ (huà) is just mentioned as a natural part of this mix of characters.